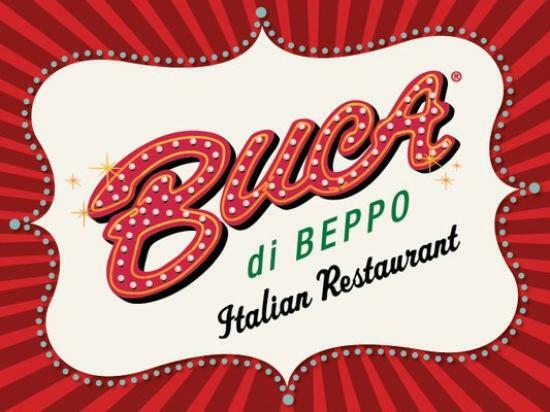 One night, for reasons unknown to me, I ended up at a family-style Italian restaurant chain called Buca Di Beppo (say that three times fast) that serves food in monstrous proportions. There’s just no way you could eat there by yourself without using a wheelbarrow for a doggie bag. To finish one plate, you’d need at least three hungry lumberjacks. I don’t know where they get plates that big. These plates don’t crumble under their own structural density, let alone under the mountain of food they pile on top of them. They’re an engineering marvel. If you don’t have a large family, a big group of friends or three hungry lumberjacks, don’t even bother going. To serve these wholly American dishes – I say wholly American because the servings are at least nine times larger than one actually needs – the monster plates come equipped with monster utensils, of course. A fork and a spoon so large that one has to use two hands to pick each of them up. Wait, that can’t be right. That would mean that you’d need four hands to use them both together. OK, so maybe that was a bit of hyperbole. Anyway, I can say with relative certainty that the utensils are, at the very minimum, five times bigger than those of a normal human-sized restaurant. In fact, everything at Buca Di Beppo is designed to make you feel Lilliputian. The rooms are huge, the tables are taller than normal; your feet dangle from the booths, not able to actually touch the ground. Even my friend, who normally towers over everything at well over six feet tall, looked like a child while holding the utensils (with only two hands). Naturally, never having seen a spoon quite so large before, I carefully picked it up with two hands and examined it. I knew from the start that this was no ordinary spoon, but on closer inspection, I discovered that this spoon had a name. Neatly engraved in capital letters on the handle was the name VOLLRATH. 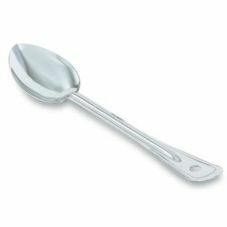 Now, I don’t know about ordinary folk, but when I encounter a spoon with a name, and that name is Vollrath, well, it speaks to me. The spoon told me, not in so many words, that it wanted to go home with me and I obliged by smuggling it out in the sleeve of my coat. So, now this spoon, formerly destined to a life of servitude, was freed by my hand. It was ever so grateful. Vollrath told me, again not with words exactly, that it would be my lifelong friend and that it would do its best to protect me from the evils of this world. I was happy, Vollrath was happy, the birds sang and the bees buzzed. We did a little dance in the parking lot before I gently cradled it next to the emergency brake in my car as we glided off into the night, my spoon and I.
I felt mildly guilty about leaving all those other utensils behind, but the fork didn’t even have a name. A week or two after The Great Spoon Liberation, I went to a show. This particular show was Punk Rock Karaoke. They’re almost like a super group made up of musicians from such notable punk bands as NoFX, Bad Religion, The Circle Jerks, Social Distortion, Adolescents, DI and Agent Orange to name a few. The singer for Punk Rock Karaoke is any ballsy jagoff in the audience who has the nerve to get up on stage and sing with them, karaoke style. You sign up, pick one of the 50 plus songs, and just like regular karaoke, you sing while they play the song, only the music is live. It’s a bizarre, but brilliant concept and a hell of a lot of fun. You could not pay me to get up on stage, but some friends of mine did. I’ve been to countless punk rock shows over the course of my life and I’ve collected a multitude of items thrown from the stage: guitar pics, set lists, drum sticks and even a tie. One wonders what to do with said items after a while since they tend to pile up. Just what does one do with thirteen different used drumsticks? At Punk Rock Karaoke, I happened to catch the drumstick; not for trying, but because it was thrown directly at my head. Rather than risk another head wound, I caught it. After the show, away we went to my car where Vollrath still lived. I gently placed the drumstick parallel to Vollrath on the other side of the emergency brake. The vast city of Los Angeles is known for carjacking. Or at least it used to be in the 90’s. In the decade that I’ve lived here, I’ve never seen a carjacking nor even heard of one, but it’s always a little bit in the back of my mind when I stop at red lights. As I was stopped at one such light with a giant spoon and a regular-sized drumstick nestled on either side of my emergency brake, it occurred to me. 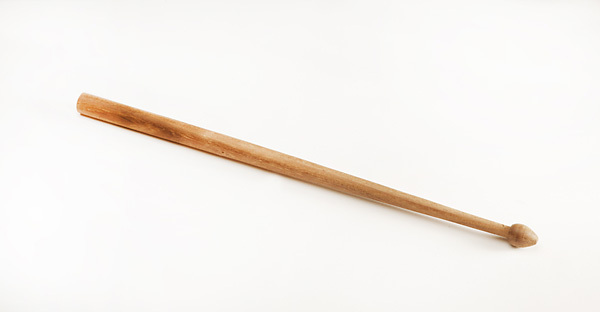 If someone tried to steal my car while I was in it and I came at them with a used drumstick and a giant spoon shouting words like “Sick ’em, Vollrath!” they’d probably just think I was crazy and go away. Vollrath and the Drumstick still live in my car. I’ve never had to use them. Part of me wishes that I could try out my Carjack Defense System just once, but most of me is grateful that I’ve never had to use it. But beware carjackers! Vollrath and the Stick, ever my faithful servants, lie in wait. Posted in funny business, stories and tagged imaginary friends, inanimate objects, Los Angeles, personification. Bookmark the permalink. I’m busy lately, what with stupid work and stuff, so I’m cheaping out and giving you another reblog. This post proves that mental illness is not a recent affliction. Alas, no, I’ve been insane in the gray stuff since at least 2010, when this post was published. It’s yet another story of ridiculousness, and yes, I still have Vollrath & The Stick. I have never eaten at a Buca Di Beppo. And I am not a fan of punk rock and have never been to a punk rock concert. Still, I enjoyed this post. However, I do have one criticism. You wrote, “…such notable punk bands as NoFX, Bad Religion, The Circle Jerks, Social Distortion, Adolescents, DI and Agent Orange to name a few.” I have never heard of any of these bands. Not a single one. I was curious if there is a punk band named “DI and Agent Orange” or if that is really two punk rock bands, once called “DI” and the other called “Agent Orange.” So I Googled to find the answer to this very important question and I learned that they are, indeed, not one band (like, say, “Gerry and the Pacemakers” or “Derek and the Dominoes” or “Simon and Garfunkel”) but two individual bands, albeit they sometimes do perform at the same venues on the same nights. So what, you ask? Well, this whole confusion could have been avoided if you would have employed the use of the Oxford (aka serial) comma. It would have been perfectly clear, had you written, “…such notable punk bands as NoFX, Bad Religion, The Circle Jerks, Social Distortion, Adolescents, DI, and Agent Orange to name a few” that DI and Agent Orange are two distinct punk rock bands. And so I rest my case in defense of the Oxford comma as a way to enhance the understanding of the written words in a list or more than two items. I also hope that you never have to use Vollrath & The Stick to defend yourself from a potential carjacking. 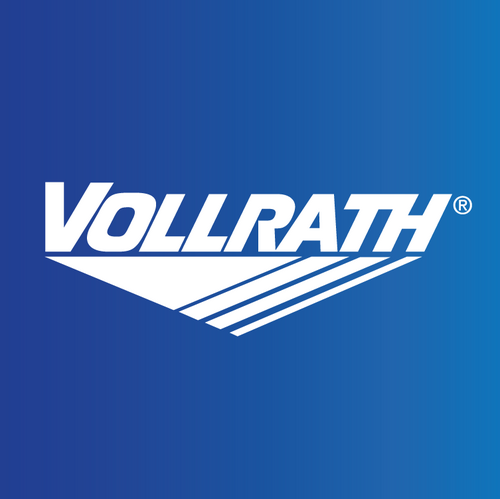 And I would seriously encourage any new punk rock band to choose the name “Vollrath & The Stick” as the band’s name. Pffft. This whole confusion could have been avoided if you knew your punk bands. And that makes me feel proud! Bwahahaha! And here comes the Doobster, and he whips out the Oxford comma and attacks! Man on a mission. Let all be warned – have your defensive Oxford commas prepared, because you never know when a Doob attack will materialize out of now where. Bwahahaha! Restaurants that serve family style plates to a single patron piss me off. It’s supposed to be family style meaning you share it, not that much for one person and add to the issue they even give you serving size utensils to eat with? They are part of the problem with American obesity. Isn’t that when your friend Jack takes the car? I think it’s when you use a jack to change a flat tire. Or when your friend Jack has a flat tire and has to jack the car. Jackcarjacking. Great defensive weapons FOG – we are considering making you an honorary Canadian. Spoons and sticks are our favorite defensive weapons. You have seen nothing until you’ve seen the devastation wrought by a nuclear tipped stick.